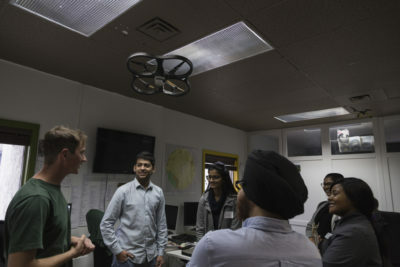 TRU’s Career & Experiential Learning department organized a bus tour intended to connect science and engineering students with young and innovative technology companies in Kamloops. 25 students were able to see the activity at the Kamloops Innovation Centre followed by the operations at iTel Networks, an internet and telecom service for businesses. Vince Watson, events and marketing, provided some context on the mission of this tour. At each venue, students were divided into smaller groups where they would be able to connect with different local business owners and receive a sense of what it would be like to work for their company, followed by an info session and networking group activities. Beth Quirie, Community Builder at Kamloops Innovation, is eager to engage more students in events like the tech tour. Quirie mentioned that of the five companies that were on the tech tour, four of them are actively looking for co-op opportunities or full-time hires. Sarah Ladd, Co-op Coordinator, Engineering, put into perspective how effective initiatives like the tech tour are for motivating students. Both Watson and Ladd assure more events like this will be offered in the future for students, if budget allows, possibly offering similar opportunities for students in other faculties. Due to high demand, some students had to be turned down on attending the bus tour, nevertheless, Watson has considered this experience for future trips.